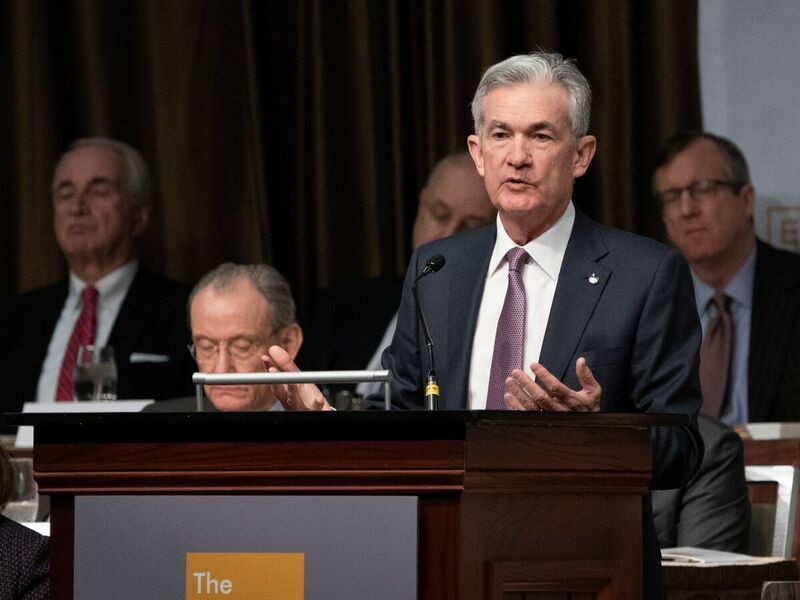 Fed Chief's Remarks On Economy And Interest Rates Cheer Investors Federal Reserve Chairman Jerome Powell said that the outlook for the U.S. economy remains solid and that interest rates are nearly within a "neutral" range, touching off a surge in stock prices. In a speech to the Economic Club of New York on Wednesday, Federal Reserve Chairman Jerome Powell said interest rates are just below the range of estimates that would be "neutral" for the economy. The phrase "just below" neutral might seem bland or innocuous. But those words from Federal Reserve Chairman Jerome Powell touched off a wave of optimism among investors who took them to mean the central bank may be winding down its interest rate hikes. The Dow Jones industrial average closed up more than 600 points, or 2.6 percent, Wednesday. Powell said that the outlook for the U.S. economy remains solid and that interest rates are nearly within a "neutral" range. That appeared to signal that while the Fed may raise interest rates again next month, it isn't overly concerned about inflation, assuaging fears among many investors that rates will continue to climb for the foreseeable future. "Congress assigned the Federal Reserve the job of promoting maximum employment and price stability. I am pleased to say that our economy is now close to both of those objectives," Powell said in an appearance at the Economic Club of New York. "Interest rates are still low by historical standards, and they remain just below the broad range of estimates of the level that would be neutral for the economy — that is, neither speeding up nor slowing down growth," he said. The comments appeared to be something of a reversal from remarks Powell made in a PBS interview in early October, when he said rates were "a long way" from neutral. Those comments have been widely blamed for contributing to the slide in stock prices since then. In his New York speech Wednesday, Powell did not dispute the widely held belief that the Fed will raise interest rates again in December, saying, "There is no preset policy" about tightening. But his words were comforting enough to investors to send stock and bond prices soaring. The speech was focused on stability in the financial system, and Powell cited four potential vulnerabilities for the economy, including excessive leverage and debt loads in some sectors. While Powell said Fed officials are monitoring these risks, they are not, on the whole, too worried about them. "My own assessment is that, while risks are above normal in some areas and below normal in others, overall financial stability vulnerabilities are at a moderate level," he said. Powell was not asked about escalating criticism of him from President Trump, who has complained that rising interest rates are hurting the economy. "I'm doing deals, and I'm not being accommodated by the Fed," Trump told The Washington Post this week. "They're making a mistake because I have a gut, and my gut tells me more sometimes than anybody else's brain can ever tell me." Trump directly criticized Powell, whom he appointed as Fed chairman. "So far, I'm not even a little bit happy with my selection of Jay. Not even a little bit. And I'm not blaming anybody, but I'm just telling you I think that the Fed is way off-base with what they're doing."